One of the biggest areas of untapped potential for additive manufacturing is the oil and gas industry. 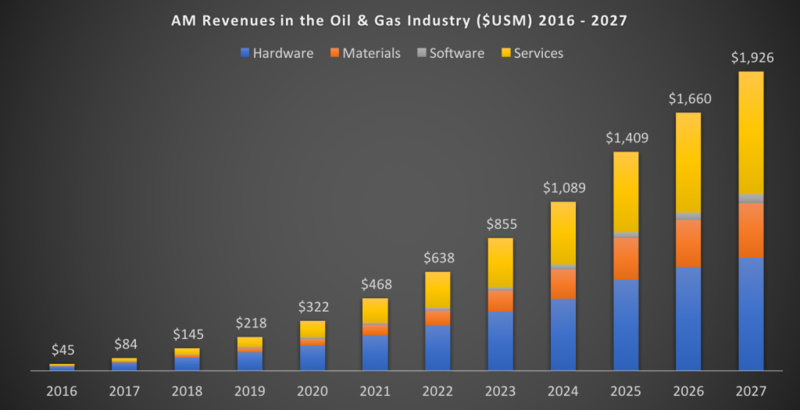 Comparatively slow to adopt additive technologies, the oil and gas sector lags behind industries like automotive and aerospace in finding applicable use cases for AM. However, with the industry facing serious challenges from oil price volatility to shifts towards alternative energy sources, the need to reduce operational costs is becoming increasingly pertinent for stakeholders within the sector. Additive manufacturing could be one of the solutions to achieving this reduction in operational costs by streamlining production and simplifying supply chain complexity. From equipment maintenance to prototyping and more, we’ve identified four key opportunities where the sector can fully take advantage of 3D printing technology. One of the key benefits of 3D printing is its ability to speed up the product development process. Using additive manufacturing, product designers and engineers can visualise, develop and validate their designs quickly and cost efficiently. This benefit can be leveraged by the oil and gas industry to better react to emerging market opportunities and evaluate any potential risks or faults at the design stage, prior to production. Precedents in this area have already been set: in 2016, Dutch multinational Shell used 3D printing to successfully prototype a buoy for the Stones oil and gas drilling station in the Gulf of Mexico. Using 3D printing to produce the miniature prototype, engineers were able to produce plastic versions of the prototype in the space of four weeks, in contrast to the months it would require with conventional manufacturing. Engineers were also able to evaluate how to improve components and establish the most efficient assembly sequence before building the real-life buoy. Another example is Siemens, which recently showed off its 3D printed burner for an industrial gas turbine. Thanks to the additive manufacturing process, the burner could be produced in one piece instead of being manufactured in 13 separate to be welded together. This improvement in design will help extend the operational lifespan of the component and, ultimately, the gas turbine. Similarly, GE Oil & Gas have developed a burner for its NovaLT16 gas turbine, using additive manufacturing to reduce the development and validation stage by 50%. 3D printing will require oil and gas companies to rethink traditional approaches to design – with the added advantage of producing complex components with enhanced performance. However, the benefits of such a change are enormous: from shorter product development cycles to greater material savings. While the oil and gas industry has been slow to embrace 3D printing for production, in this area, the technology holds great promise for the sector. Due to high tooling costs and the need for longer lead times, traditional manufacturing is typically unsuitable for low-volume production. Additive manufacturing can help to significantly reduce lead times (delivering parts in a matter of days instead of weeks for example) whilst lowering production costs. For example, additive manufacturing can be used to manufacture smaller quantities of complex, specifically designed parts whilst making efficient use of materials. Siemens and Baker Hughes, a GE oilfield service company, believe 3D printing can revolutionise the production of numerous components, including pumps, turbomachinery, valves, and gas turbine nozzles. Both companies are already active in the additive production of high-value components. Scheduled or unplanned downtime due to equipment maintenance can be expensive, especially in remote or offshore rigs. Here too, 3D printing can make a difference. Some additive technologies like Direct Energy Deposition can not only be used to manufacture complex and bespoke components but efficiently repair or remanufacture worn out equipment. Applying the technology to ageing or damaged components like shafts, valves, and pumps, can increase their lifespan and performance, thereby reducing overall running and maintenance costs. Additive manufacturing could have a positive impact on supply chain management within the oil and gas industry. One key benefit is the shift towards the on-demand production of spare parts. In remote, offshore regions where the supply of replacement parts is limited or where logistical issues are likely to cause delays, the ability to produce parts at the point of need could help to significantly reduce the time and expense associated with sourcing replacement or spare parts. Additionally, oil and gas operators currently maintain large inventories of spare parts to minimise unscheduled downtime in the event of part failure. With additive manufacturing, many spare parts, for example for legacy equipment, can be reverse engineered to create a digital inventory for on-demand production, thereby reducing warehouse stock and storage costs. In the long term, on-demand production and the digital storage of files could transform the supply chain and distribution network within the industry. 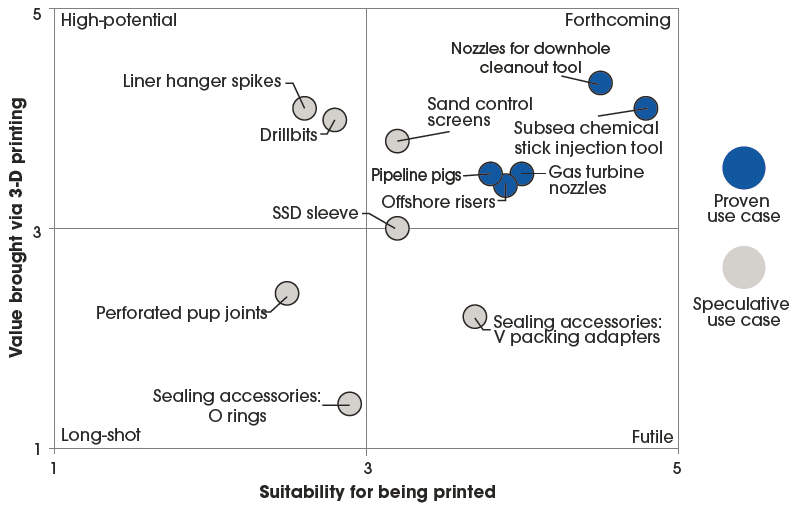 To date, the uptake of 3D printing within the oil & gas industry has been limited. In an industry that is typically risk-averse, there currently lacks the manufacturing infrastructure to fully integrate additive manufacturing into the production and supply chain process. Another challenge concerns certification and part qualification. Ensuring a repeatable and reliable production process is crucial for the tightly regulated industry, and 3D printed parts must meet rigorous regulatory standards. For this reason, it’s vital that companies develop a robust regulatory framework to improve confidence in 3D printed parts and simplify their certification across the industry. Finally, oil and gas companies face the challenge of identifying suitable use cases for 3D printing. In other industries, manufacturers have generally chosen to print highly complex parts that are needed in small batches. However, this approach may not always be suitable for the oil and gas industry, due to the complexity of its supply chain. That’s why it’s essential for the industry to develop its own 3D printing framework to identify cases and suitable technologies. Early adopters will be needed to pioneer this path, as has been the case within the aerospace and automotive industries. Nevertheless, as demonstrated by the likes of the aerospace and automotive industries, the benefits of additive manufacturing far outweigh the challenge of developing a strategic approach to the technology. As the oil and gas industry looks to improve operational efficiency, disruptive technologies like additive manufacturing will increasingly take centre stage. Investment in additive manufacturing facilities and research centres will help to build the necessary infrastructure to ensure long-term adoption of the technology. Overall, additive manufacturing could enable oil and gas companies to streamline operational processes, achieve significant cost savings and create new, more efficient, ways to develop, produce and maintain equipment. 3D printing could become a commonplace technology in offshore facilities or at regional hubs innovating supply chain operations. Over the next decade, as applications are identified and new opportunities arise with 3D printing materials and technologies, the oil & gas industry is bound to open up to the benefits of 3D printing and capitalise on them.